Equipment check time is here. 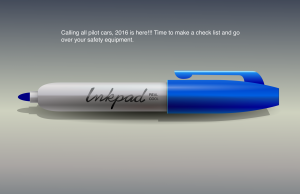 It’s a good time for pilot cars to perform a safety equipment check. Let’s take a moment and check all that safety equipment for the 2016 season. The 2016 season is right around the corner. You have to admit there’s nothing like the smug satisfaction a person has from knowing that all of your equipment has been gone through, checked, organized, serviced and ready to go. When everything is in tip top shape and you know you’ve done your best and are truly ready to hit the pavement and roll with the widest, tallest shipment anyone can call you with. The difference between an outdated fire extinguisher and a current one is huge. Sure you can get fined or even shut down but the real difference is if you actually need it. The same goes with signal flares or any time sensitive equipment for that matter. It’s your job to be prepared. Just to go over it, your number one responsibility when you’re on the job is to safely protect motorists. After that comes utility obstructions, bridges and the actual load itself. The safety of motorists is number one on your priority list. It’s easy to get into the routine of seeing your job simply as the leader or follower of oversize shipments with the “right” to sound off in a bullhorn or even worse try and chase another vehicle away from the load. However your purpose is much greater than that which is why it is your responsibility to make sure your equipment is operating at 100%. If your super man/woman suit is needed you will be ready. Below is a list of things just to help jog your memory. Comments and additions are welcome. Check the tires on your rig all the way around closely for any nails, screws, bubbles or belt brakes. Also check the air pressure. Be certain all signal flares, fire extinguishers, etc. are not expired. Batteries with spares are all fully charged. Go through your signs and flags to ensure they’re in good shape. Check all of your lights, amber, signals, etc. Test your CB radio and communication devices. Make certain all of your log books and mileage books are ready to go. Wiring. Check all of your custom wiring and connections. Make sure they are tucked away properly. It’s important that each and every one of the companies associated with us have a safe and prosperous season for 2016. Everyone please keep your eyes and ears open. Be eager to accept feedback whether you want to hear it or not and finally have a good tour.